One of the first posts I wrote here was about the power of practicing reciprocity. From an influence perspective, reciprocity is the act of giving someone something with no expectation of getting something back. The gift builds up an internal debt within the other person that they feel compelled to repay. Robert Cialdini included reciprocity as one of his key principles of influence in his classic book "Influence: The Science of Persuasion." The focus with reciprocity is usually on how by initiating an 'exchange', we can use the internal debt in the other person to help us when we want to influence them. 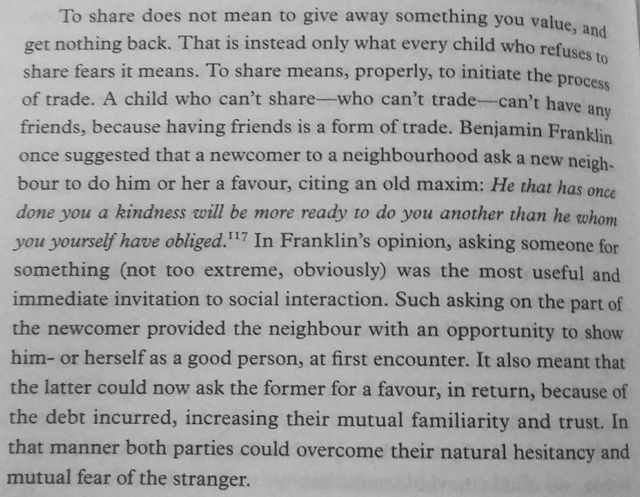 An alternate perspective comes from Benjamin Franklin via Jordan Peterson's book "12 Rules for Life" and is in the photo below. It removes the fear of being indebted. Although reciprocity is very powerful, some people will do anything to avoid feeling indebted, whether this is conscious or not. By asking for something first, the initial burden goes in the other direction even though later on this may be flipped. It helps build trust. Asking for something says "I need you to do this, I can't do it alone." This requires a belief in the person asking for something that they can trust the other person. A great way to build trust is to show trust. Both techniques can be really useful when trying to build a network of influence, although Franklin's technique can only really be employed early in a relationship and only if the request can be small. Make the request too big and other person is more likely to resist. Reciprocity can continue to be used throughout relationships and remains for me, one of the most powerful ways to build up a surplus in your influence bank account. "He that has once done you a kindness will be more ready to do you another than he whom you yourself have obliged."